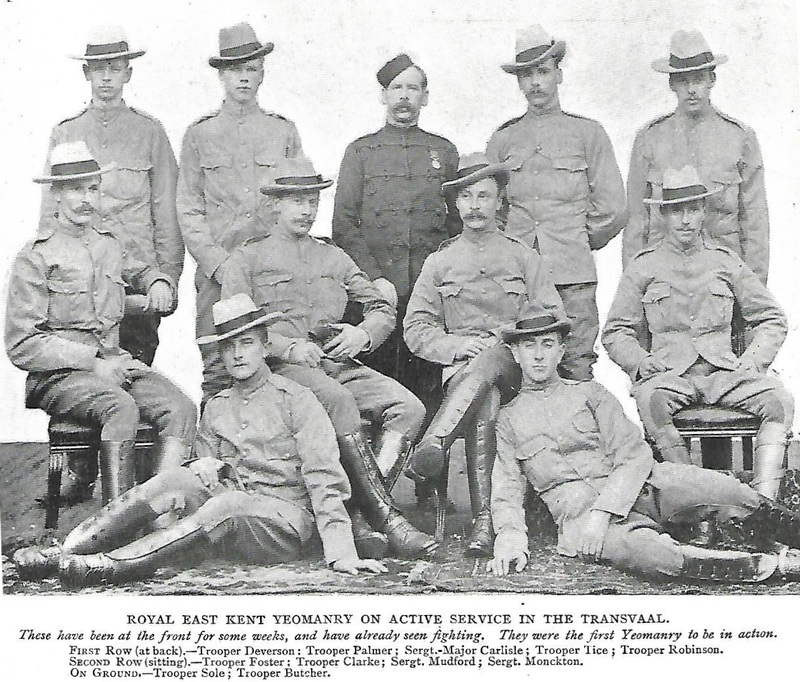 Royal East Kent Mounted Rifles and the South African Light Horse. One feature of the Second Anglo-Boer War was the fervor among civilians (men and women) to volunteer for the forces of the British Empire. Many civilian units are well known that were raised in South Africa, New Zealand, Australia, Sri Lanka and Canada . Volunteers from the UK arrived in 1900 with the Imperial Yeomanry, but a small number were determined to join the fray before then. When they arrived in Cape Town they learned that the ILH had been besieged in Ladysmith, so they decided to join the South African Light Horse being raised in Cape Town. This group suffered just one casualty, Ernest Sole died of enteric fever at Standerton on July 21st, 1900. He is remembered with a memorial in St Mary's Church, Stodmarsh, Kent and the Kent units memorial in Dane John Park, Canterbury, Kent. Sgt-Major Mudford was MID and awarded the Distinguished Conduct Medal (London Gazette 08-02, 27-09-1901). Sgt HH Clarke was MID (London Gazette 08-02-1901). Of the remaining 10 they all returned home in 1900 apart from GP Tice who was commissioned into Robert's Horse and later served with the Prince of Wales Light Horse, South African Mounted Irregular Forces and finally 9th bn Imperial Yeomanry. Tice remained in South Africa taking part in the 1906 Natal Rebellion (L-Cpl Transvaal Mounted Rifles). He fought in World War I as a Major in the Lancashire Fusiliers. The 10 received their medals from King Edward VII on July 26th, 1901 in a large parade. The weather was foul, rain delaying the start. When the men received their medals, they were without clasps, these were issued later. I have recorded five of the eleven QSAs: Clarke, Butcher, Deveson and Mudford and Tice. The medals to Clarke, Butcher and Deveson are named to the "RL: E. KENT M.R.". Tice's QSA, because he was commissioned, is named to the SAMIF, not the unit he first served as when he was an other rank. Main image is from The Transvaal in War and Peace, N Edwards, H Virtue & Co, 1900 page 201. The picture was taken before they left for South Africa. 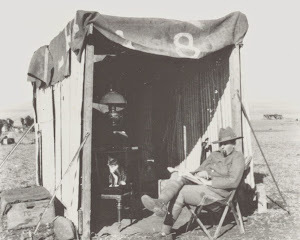 Sgt-Major Carlisle did not go to South Africa. 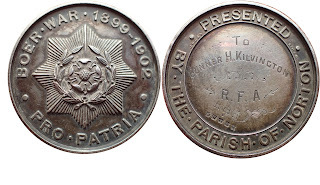 Tribute Medals are a particular feature of the Second Anglo-Boer War, not being a common item for previous or subsequent wars. 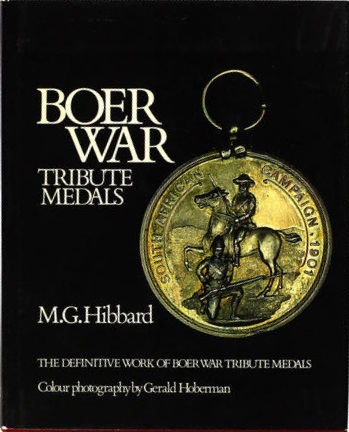 They are well documented in MG "Bill" Hibbard's excellent Boer War Tribute Medals (Constantia Classics, Sandton, 1982), and Canadian Welcome Home Medals 1899-1945 (George A Brown, Douglas Ferguson Historical Research Foundation, BC 1991). Tribute medals for the Second Anglo-Boer are uncommon at best and some are simply unique. The medals are often made from gold or silver and were expensive in their day. Not surprisingly, they are highly collected today. More common examples include Birmingham (left) and the Montgomeryshire Imperial Yeomanry (right). The medal I want show today is one rated by Bill Hibbard as R3 (two to four known) and second only to R4 "only example known" - the tribute medal issued by Norton (or Norton Malton) in North Yorkshire. This medal was issued named which makes it great for research. The decision to issue a tribute medal was made at a town meeting on 16th October 1903. Local resident Colonel Sir James Legard and his wife of Welham Hall had placed a window in St Peter's Church in memory "of those who fell in war and those who returned in peace". Their son, Captain AD Legard, 1st bn King's Royal Rifle Corps, was one who returned safely. Additionally a dinner was to be held for the veterans when the window was unveiled on 12th November 1903. At the meeting Col Legard said that 43 men from the village served in the war representing 13% of the population. Memorials were also erected for five men who died and 40 who survived (it is not known the reason for the discrepancy between Col Legard's 43 men and the 40 named on the memorial). When these memorials were erected is not known, but must coincide with the award of the tribute medal. There is a further memorial to 2nd Lt FH Raikes 2nd bn KRRC who was killed 6th January, 1900 at Wagon Hill defending Ladysmith. Cpt Legard was at the siege of Ladysmith. 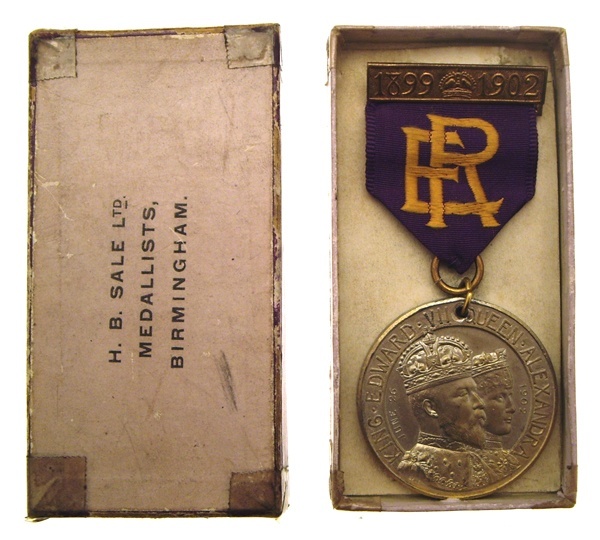 The medal is silver, 36mm in diameter and made by JR Gaunt & Sons, Birmingham. The medal contain hallmarks for 1903. Hibbard indicates 2-4 were issued - on what basis is not known. Judging from the meorial to the survivors there must be 40 medals, which on Hibbard's scale rates as common - survival of the medals today is another matter. Hibbard only identifies one recipient: Trooper 12309 CP Benson (Yorkshire) Imperial Yeomanry. From my searches only two are known to exist. The medal illustrated was given to Gunner 51107 H Kilvington 82nd btty Royal Field Artillery. Herbert Kilvington was born in "Malton" in 1868, he enlisted into the RFA at "New Malton" in 1885. Herbert served in Burma (IGS medal and clasp Burma 1889-92). In South Africa he served from January 1900 to August 1902. In 1901 he transferred from the 82nd btty to LL section pom-poms. For his service he was awarded the QSA with clasps for Cape Colony Orange Free State, Transvaal and Laing's Nek and the KSA with two date clasps. After the war he worked at the North-Eastern Railway dockyard as a labourer. In 1896 he married Elizabeth, they had no children on the 1911 census. In 1914 on the outbreak of World War 1 he re-enlisted for the Military Police but only served 27 days. Herbert died in Hull in 1942, aged 74.